iDEC gives you professional rack integration of your iPod into any live DJ or music rig. With high-performance digital audio and video playback, quality audio recording, and its convenient interface with both the 19-inch rack world and docking to your computer, iDEC is a must-have for every rack! PUT THE PIECES TOGETHER WITHOUT THE PUZZLE. 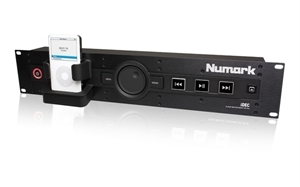 iDEC's universal dock for iPod lets you can play audio and video from any docking iPod out through integrated outputs, or instantly capture incoming audio at CD-quality 44.1 kHz sampling rate. Large transport controls enable easy iPod operation even on stage or in dark environments. Bands will find iDEC a great addition to their setups because it enables simple, convenient recording of gigs and rehearsals, and solo performers can use iDEC as a player for backing tracks on iPod. Whether you are a DJ, musician, or installation professional servicing bars, restaurants, or large stadiums, iDEC is the ideal pro-grade solution for iPod recording or music and video playback.